Yes! The rain is back! The question is do you get to enjoy it? Or do you dread it? 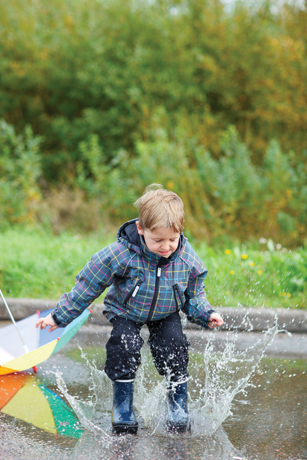 If we let children do as they please, they LOVE playing in the rain and it’s a most marvelous sensory experience! They don’t care about getting wet (as long as they get dry again afterwards), they don’t care about the mud splashes, they just don’t worry about things getting ‘messy’. The fall is a wonderful season of different experiences for our sensory system – wet, cold, windy…….. those are important experiences to have. So let’s enjoy them, play with your children in the rain and make a muddy mess!